Should you polish a car by hand or machine? Should you wax or polish a car? Find out everything you need to know about polishing and waxing a car. If you polish a car on a regular basis, you can vastly improve the lifespan of its exterior. This will provide aesthetic benefits, but it will also help to protect your investment. Deciding to polish a car or wax it can be a difficult choice without some understanding of what each does and how they differ. Polishes tend to be designed to remove paint imperfections and prepare the paint finish for waxing, providing a deep shine and protection from the elements. Modern car finishes have a protective clear coat on top which can easily show swirl marks and scratches, especially on darker paint colors, so it is best to use only products intended for use on clear coat finishes. Before a car can be polished or waxed it must be properly cleaned. The dirt on a car can be abrasive; therefore, it is best to thoroughly rinse off as much of the dirt and grime as possible prior to washing. Avoid getting water on the engine or any electrical parts under the hood, as this may cause damage. Only use products designed for automotive finishes; harsh cleaners can damage the paint. Washing and rinsing the car section by section, starting with the roof, will help prevent water spots which can be difficult to remove after the car has dried. 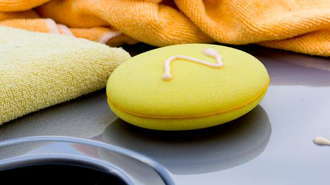 After thoroughly washing and rinsing, dry the car using an automotive grade microfiber cloth or squeegee. Car polishes are generally longer lasting that car wax and provide better protection; although, they may not provide as much shine. A high quality polish can help eliminate minor surface scratches and swirl marks if used correctly. Car polishes are slightly abrasive; they strip the paint surface, so it is highly recommended that a car also be waxed after it has been polished for an added level of protection. Some experts suggest avoiding the use of polish on newer cars and instead stick to using only a high quality wax. Many new auto polishes also contain waxes to provide a high level of protection and shine. Car wax options include paste or liquid and usually contain carnuba or synthetic wax. Carnuba waxes tend to give a better shine but do not last as long as synthetic waxes while synthetic waxes tend to provide a higher level of protection, especially against the sun. Some people may choose to layer carnuba wax over a synthetic based wax in order to achieve a higher level of protection and deeper shine. Cars should be waxed several times a year in order to maintain the proper level of protection. If a soft cloth does not easily glide against the surface of a clean car, or if water does not bead on the surface, it indicates the car needs to be waxed. Car wax sits on the paint surface to protect it from the elements. Older cars will benefit the most from a car polish, especially if the finish has begun to fade or show other surface imperfections. Following this up with a coat of high quality wax will help protect the finish from further damage. Regular washing and waxing will help maintain the showroom shine and protect the paint finish from damage. Check the owner's manual or with the dealer to determine the best type of product to use. Car Waxing Temperature: When Is the Best Time to Wax Your Car? Car Wax Comparison Guide: Which Wax Is Best for You? Car Polish and Wax: Are They the Same? Which Comes First?